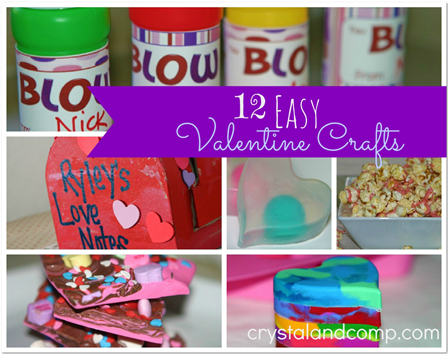 Valentine Crafts: 12 Easy Valentines for Kids! You are here: Home / DIY / Valentine Crafts: 12 Easy Valentines for Kids! Are you looking for easy Valentine crafts you can do with your kiddos? I have some fun ones to share with you. We love making these to give to friends. Many of them come witha FREE printable and are perfect for handing out to classmates, teachers, neighbors or as a homeschool craft activity. Each craft includes supply lists with simple step by step instructions. These crafts are all budget friendly and will not break the bank. Wait until you see how easy they are to create and the little ones will love helping! My kind of projects! Blow Me Away Bubble Valentine– this FREE printable fits perfectly on the party favor 2 oz size bubbles. This is a fun treat that is sugar free! Cupid Poo FREE Printable – this FREE printable is adorable. Put Valentine colored m&ms in a clear cello bag, staple the printable on and you have a fun treat that boys especially love. Valentine Mailboxes- I love these paper mache mailboxes that little ones love to decorate. A great place to leave Valentine notes! Valentine Popcorn – oh, this is easy and yummy. This treat is perfect for your Valentine party and takes 10 minutes to make. Marshmallow Valentine Pops– love marshmallows? Make these! Super easy and the kids will have a blast making them and giving them to their friends. Decorate with Heart Candy– here is a fun and inexpensive way to decorate for your Valentine party. Think outside the box with these conversation hearts. Sucker For You Printable– every child loves to get and give suckers! You will love this I am a Sucker for You FREE printable. Recycled Heart Crayons– this is the most viewed Valentine craft on my site. Take leftover and broken crayons and convert them into a Valentine treat. You will adore the FREE printable that goes with them! Valentine Bark– this is the perfect treat for your teacher. There is a FREE printable to make gift giving super easy! Mod Podge Vase– do you love to give flowers to your teacher for Valentine’s Day? Maybe you want a sweet, homemade flower arrangement for your Valentine table. Re-purpose spaghetti jars to make these personal vases! Valentine Soap Printable– this soap tutorial is another fun projects the kids will love helping you with. It comes with a FREE printable so you can hand them out to friends and there is a treat inside the soap! Score! Cupcake Spa Socks– take spa socks and convert them to a teachers gift that looks like a cupcake! Love!! I cannot wait to see what you make. I know you’ll have a blast creating! Crystal is a homeschool mom of all boys. She loves sharing craft tutorials, easy recipes and helping moms learn how to meal plan. Stop by and check out her mommy resource site- Crystal & Co.